The commercial real estate industry is rapidly changing and many new trends have roots in the past that can shape how we move forward. 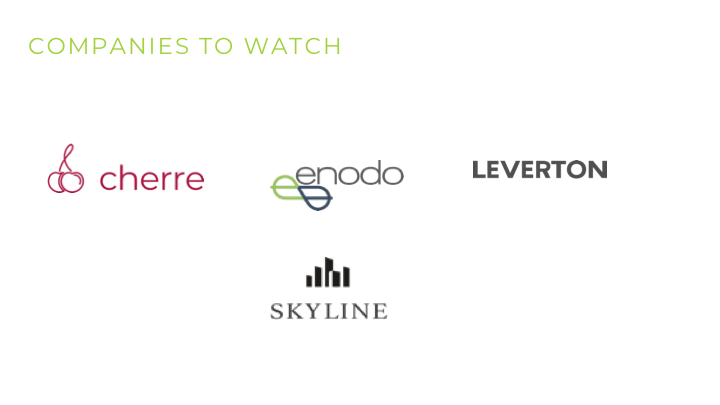 Each quarter, and with the help of leading players within particular industry segments, CREtech will examine key trends and companies shaping the industry. This quarter, we’re starting with multi-family tech—a segment that has seen massive transformations in the 21st century as a result of the continued demand for housing in urban centers teamed with the corresponding rise in consumer tech expectations. According to the CBRE 2018 US Real Estate Market Outlook, multi-family developers are on pace for the second-highest annual completions count, with over a quarter million units expected. Adoption of tech is rapid across all areas and there is no doubt tech will continue to infiltrate every aspect of the lifestyle at both work and home—multi-family being the latest victim. To take the pulse of the industry, the CREtech Innovator Survey asked a broad base of thought leaders about technology’s impact on multi-family commercial real estate. Let’s dive deeper into the coming changes. 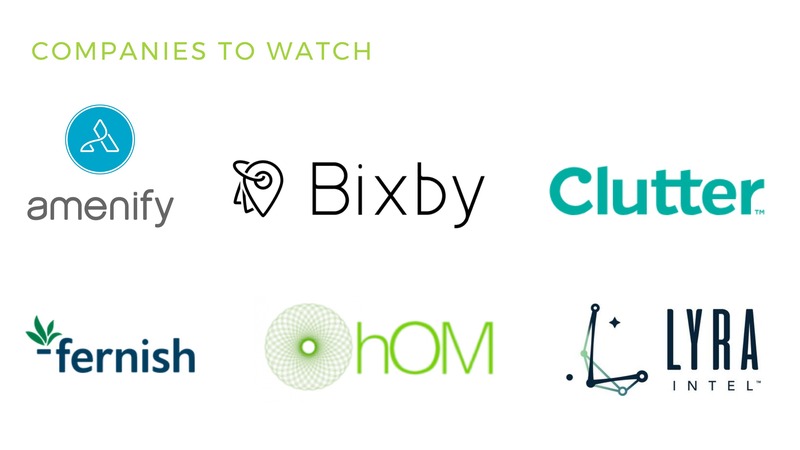 Below are five key trends to watch—and integrate into your properties—in 2019, along with several corresponding “Companies to Watch” that came from our Innovator Survey. “We are seeing Smart Apartment technology hitting its stride among multifamily owners. This is because we see property owners willing to deploy property-wide rollouts as opposed to single-unit deployments based on resident demand. The technology around smart thermostats, locks, moisture sensors and load monitoring has matured to the point where apartment owners and managers are able to underwrite the cost of deploying the technology on an operating and cost savings basis. One example is the recent LMC opening of Axle, a 226-unit luxury smart-home apartment community in Seattle with “… Amazon Echo integrated into a Sonos Play:1, Lutron Pico Remote for dimming lights and controlling smart-home speakers, and a Ruckus access-point device for superior Wi-Fi coverage.” If that wasn’t enough, units also include Lutron roller shades, controllable through a smartphone, Pico remote, or Alexa. Alliance Residential is deploying its Alliance SmartHome package, which includes Google, Dwelo, and Nest to more than 25,000 luxury apartments. Meanwhile, Gables Residential has been installing electric car charging stations at its properties. We’ve been hearing it for years now, that 5G is coming. And no discussion about smart apartments can ignore the coming wave of 5G devices. By 2020, technology research firm Gartner predicts that 20.4 billion devices will be connected through the cloud-based Internet of Things (IoT). Keep in mind, aside from the millions of mobile phones/devices, Don Clark in a recent New York Times piece noted that it will also “affect many other kinds of devices, including industrial robots, security cameras, drones and cars that send traffic data to one another.” The latter are all items affecting multi-family properties. Connectivity will go far beyond simply implementation in new developments. That’s just the beginning. In 2019 and beyond, we’ll see an explosion of multi-family properties retrofitting their entire communities with digital everything—not just because they can, but because consumers will soon expect no less. Amazon: The global tech goliath has made smart homes a huge focal point, both in terms of devices and its Alexa Everywhere vision. Learn more. ButterflyMX: A smart, video intercom system providing tenants keyless entry, two-way video calling, and managed access for service providers such as house cleaning or dog walkers. Already in more than 2000 properties, granting secure access to more than 210,000 units around the world. Learn more. Dwelo: A company providing multi-family owners, managers, and residents with web and mobile applications to control smart devices. Learn more. IOTAS: A smart-home technology platform designed for the rental market. It is in about 40 U.S. and Canadian markets—both new construction and retrofits. Learn more. Honest Networks: Provides reliable and affordable internet with no contracts. Learn more. Remotely: A technology company analyzing how smart devices are used in each unit and enabling managers to more efficiently manage their properties. It provides the ability to schedule lighting and temperature settings for vacant units and common areas. Learn more. Smart Rent: A “Smart Apartment” solution for multifamily and single family rental properties that allows control and monitoring of most commercially available smart devices. Learn more. STRATIS: An IoT Platform that provides “sidewalk to sofa” mobile access, for staff, maintenance, vendors, residents, and their guests and service providers. Learn more. Tishman Speyer: An owner, operator, and developer that has partnered with Amazon to offer smart home features at various developments. Learn more. WiredScore: A commercial real estate rating system that empowers landlords to understand, improve, and promote their buildings’ digital infrastructure. Learn more. 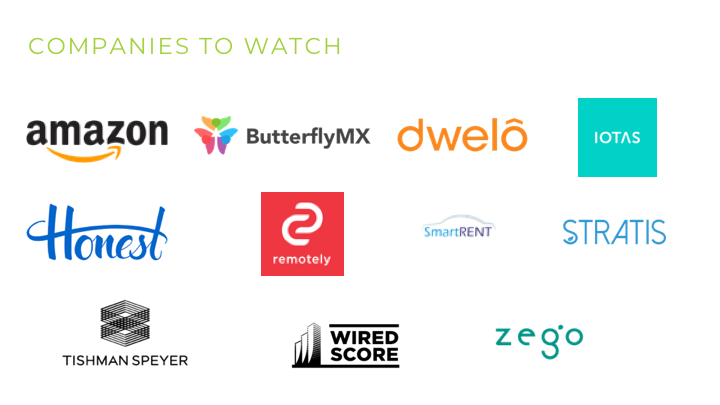 Zego: A complete smart apartment package allowing tenants of clients from from 20,000+ unit owners to small boutique developers to control all their smart home devices through a native Android/iOS app. Deployed in 20+ markets serving tens of thousands of residents. Learn more. The hotel industry is responsible for infusing another major trend into multi-family: amazing hospitality, in every way. On-demand, high-quality services are the key to reducing tenant turnover. Beyond the obvious amenities such as pet care, rideshare, and cleaning services, amenities can also mean in person experiences that directly tackle urban loneliness. hOM helps operators bring fitness programming and unique events into their buildings while Cobu facilitates unique experiences organized through partnerships with local businesses, community organizations, and mission-driven companies. The rise in telecommuting is part of the growing importance of amenities and services. Roughly 43 percent of respondents to Gallup’s 2017 “State of the American Workplace” survey said they worked remotely at least some of the time. That’s up from 34% in 2012. With more and more residents spending more time in their apartments, it makes sense they value increased accessibility of services—they are no longer out and about in the urban centers where services have traditionally been located. Convenience has become the core of this trend and “multi-family owners are making it easy for residents to remove friction from their lives,” according to John Helm. Throughout our Innovator Survey it became clear that the industry’s thought-leaders agree: The facilitation of high quality tenant amenities is no longer a “nice to have.” It’ll be table stakes to attracting and retaining tenants in the years ahead, starting now. Amenify: A platform for multi-family properties providing convenient in-home services, such as in-home massage, pet care, and fitness classes. Learn more. Bixby: A tenant and resident management platform that enables property managers to unlock the power of on-demand services for tenants through an amenity marketplace. Learn more. Clutter: A tech-enabled storage company that has raised $100M in capital and have a range of multi-family partnerships. Learn more. Fernish: Furniture subscription service that provides consumers with high-quality, modern furniture without a long-term commitment. Renters are given the option to purchase the furniture at any time. Learn more. hOM: An amenity provider that partners with residential and office properties to develop community by providing on-site fitness programming and unique events for tenants. Learn more. Lyra Intel: Business intelligence platform for property managers that includes a property engagement portal that to communicate with residents and foster a social community. Their Kaboodle app connects residents to commerce opportunities with local merchants. Learn more. AI was the New York Times’ hottest tech trend of 2018 and 2019, with the authors predicting a veritable invasion of AI into every aspect of our lives, from microwaves you can instruct to heat your food to algorithms facilitating every decision you make. As months tick by, many predictions are, in fact, coming to fruition—and multi-family is not escaping the trend. AI will be wired into the industry like electricity. Artificial intelligence and predictive analytics will undoubtedly impact the broader CRE market. According to Darren Wesemann, there is a lot of room for growth in “the application of deep learning models in real business decisioning and operations,” once technologies such as Cherre and Skyline AI are more broadly adopted. With more data available than ever before, making use of this mountain of data has becoming increasingly valuable. “From a pure technology perspective, artificial intelligence is going to have a major impact on the way multi-family is valued, acquired and operated to maximize value,” according to Travis Putnam, Managing Partner at Navitas Capital. He notes that “we’re in the very early stages of this trend taking shape, but as more and larger data sets are fused in a meaningful way, building cloud-based machine learning/AI applications is the next frontier” for multi-family commercial real estate. That next frontier will be led by a new wave of data scientists—the new CRE professionals—who increasingly trade properties by leveraging data and predictive analytics, configure trading algorithms, and predict future market cycles and trading cycles. We’re not to the point that AI can build apartments yet, but that’s becoming less and less of a stretch to consider plausible in the near future. Cherre: An interconnected data-driven platform that collects and resolves all public and private real-estate data in real-time, and provides insight into asset value and viability in order to execute more transactions. Learn more. Enodo: Analyzes millions property and market data points to help survey comps, benchmark rent and expenses, and identify value-add multi-family opportunities. Learn more. Leverton: An AI platform turning unstructured documents into insightful, structured data so real estate institutions and companies can make smarter decisions on fully transparent and accurate data sets. Learn more. Skyline AI: An artificial intelligence asset manager for commercial real estate that partners with top commercial real estate players to establish investment vehicles augmented by AI. Its array of location data helps investors make better decisions. Learn more. Adaptable, flexible spaces are the trend of the future—spaces that keep residents engaged while providing increasingly more avenues for commercial integrations for landlords and tenants alike. And these spaces will certainly need to cope with rising demands as e-commerce continues—multi-family managers are facing an increasingly complex task of package delivery across their portfolio. According to Rick Haughey of the National Multifamily Housing Council, “Most buildings (77%) now have a dedicated space for package storage, and 85% of package rooms are secured. … Nationally, 30% of communities utilize package lockers as their primary package storage method.” Some owners are leveraging Smart Apartment technology to allow direct unit delivery access to alleviate the need for package lockers altogether. Forward thinking developers will integrate retail experiences directly into their physical spaces. And if retail isn’t in the property, proximity to nearby amenities only increases tenant satisfaction—and ultimately property values for owners. Amazon Go: Retail locations that operate without cashiers first piloted in Seattle. Customers are automatically billed for their items through their Amazon account. Learn more. AppearHere: A marketplace for booking space with operations in Paris, London, and New York. 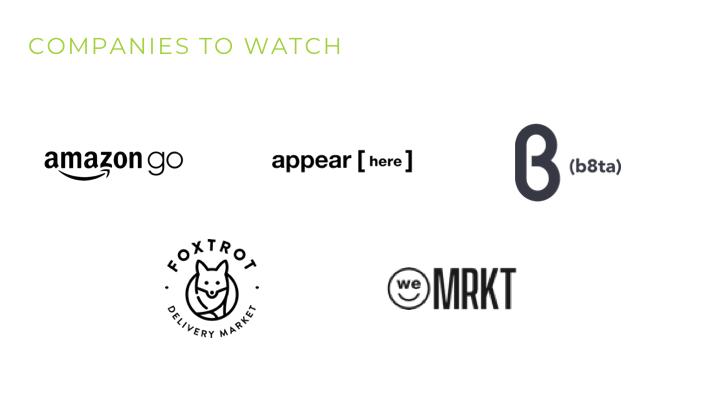 b8ta: A new retail-as-a-service model with nine flagship locations and 70 shop-in-shops across the U.S. In 2018, it launched Built by b8ta to create world-class flagship stores for brands, and Macy’s recently took a minority stake. Learn more. Foxtrot: A next generation corner store that serves as a floor-level amenity for property owners. Part of Fifth Wall’s portfolio. Learn more. WeMRKT: A “by members for members” modern retail storefront that WeWork is piloting in New York. Learn more. Co-living enables more residents to occupy less square footage, and is growing in popularity as property values rise and more people move to urban centers, where physical space is at a premium. 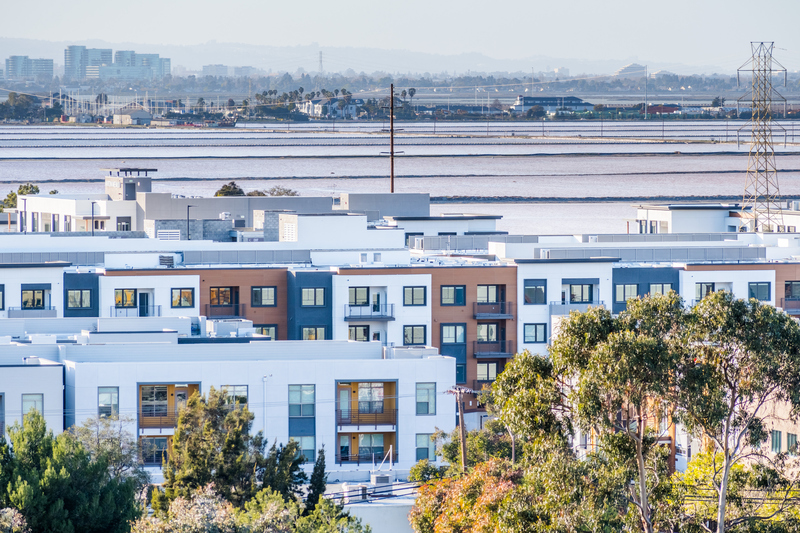 Beyond the efforts of well known players WeLive and Common, which operate properties for landlords, we’re seeing an increase in co-living investments by multi-family developers. That has included billion dollar commitments from both PMG/Raven Capital Management’s Xcommunities as well as Medeci’s investment to bring more than 6,000 units to Europe. We expect these announcements to continue in 2019 and beyond. Micro apartments—generally units smaller than 300 square feet—are a also growing strategy that capitalize on consumers’ desire for more affordable housing, and a need for less and less space. Both 1715 in Seattle and Turntable Studios in Denver are among the buildings that have already made investments in the shift. While co-living communities and micro apartments both optimize space with small units sizes, co-living communities put a greater emphasis on community interactions. Urbanization is a massive trend across the globe, and its impact will only grow in the coming years. Leading investors are closely following the trend. “With increased density in large urban areas, we’ll likely begin to see more movement towards technology and innovation trends related to categories such as co-living and micro units,” according to Fifth Wall’s Roelof Opperman. 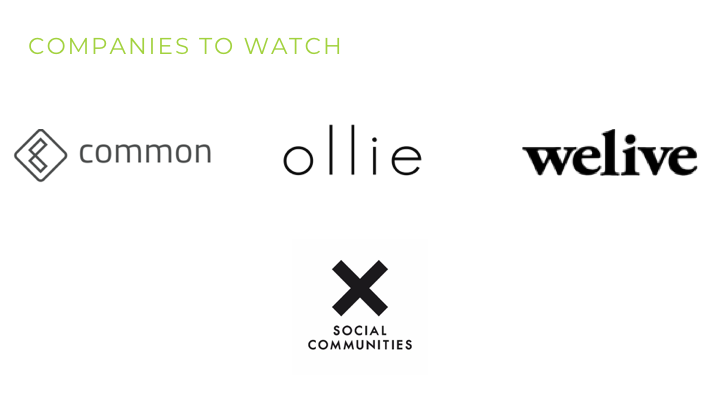 Common: The largest community-driven residential company in the US. It partners with real estate developers and investors to increase returns through property management, technology, and coliving services. Common just launched in Los Angeles with a Melrose property. Learn more. Ollie: Fully furnished studios and shared suites with hotel-style services, curated events, and extraordinary amenities. Learn more. WeLive: WeWork’s co-living initiative operates in New York and Crystal City (Virginia). Learn more. XCommunities: This partnership between PMG and Raven Capital Partners plans to build over $1 billion in co-living units. Learn more. The multifamily industry has seen an upheaval of old norms in the past two decades, but the digital transformation is far from over. The twin forces driving change come down to the demand for housing in urban centers as well as a massive rise in consumer tech expectations. “Smart” connectivity will not be reserved for new homes, but also retrofitted apartments and multi-family homes in urban centers around the country. To reduce tenant turnover, property owners must offer on-demand, high-quality amenities that make tenants’ lives better. Cloud-based machine learning and AI applications will not bypass our industry—expect huge, complex sets of data to inform the industry and transform how decisions are made. Retail is not dead, but it will not look as you expect—buildings of the future will rely on flexible, adaptable spaces able to transform alongside tenants and technology. Mass urbanization will demand more than ever from the multi-family commercial real estate, giving rise to micro-spaces where a sense of community will reign supreme. These five trends are just the beginning. Avoid the coming apocalypse for those who don’t get with the times by going digital. Disrupt or you will be disrupted. Are you ready for the future of multi-family?